Facilitating rapid shifts between focused and communicative work can be a success factor: Mobile assistants such as caddies, media caddy, sideboards, lift tables and pedestals create individual arrangements for every work situation. 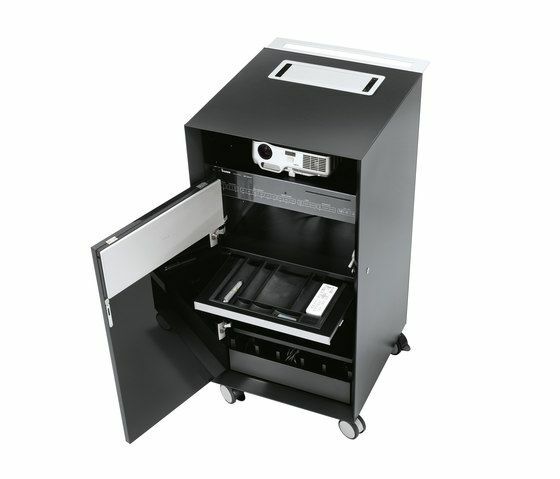 Caddies increase storage capacity in the user’s immediate vicinity, or they can be important accessory furniture for team and project work in non-territorial work areas. T-Caddy T-Caddies are attractive thanks to their significant style and can be equipped with various top features. There are four basic models, in two widths and two heights. Either as open shelves or covered with tambours, drawers or hinged doors. Lockable. The T-Caddy Expressive has a distinct form with curved veneered sideboards for representative areas. T-Caddies offer customisable storage and refined top features. With boxes, flaps, organisation rails, shelves and upholstered seating surfaces, the T-Caddy can be adjusted to meet the user’s needs and securely store your things. K2 Caddy Accessory furniture for every workplace. Formally distinct with rounded sideboards and the vertical aluminium-coloured tambour. In combination with open helving or drawers. Four basic models are available, in two widths and two heights. Mobile on castors (two including breaks), optionally on aluminium legs. AL-K Caddy offer large storage capacity right next to the workplace. The aluminium-coloured tambour cabinet with its duallayer rear wall sets the formal tone. Cart Caddy An intelligent high-tech furniture with all the options of modern media furniture. Media Caddy A fully equipped Media Caddy for information, presentation and communication.